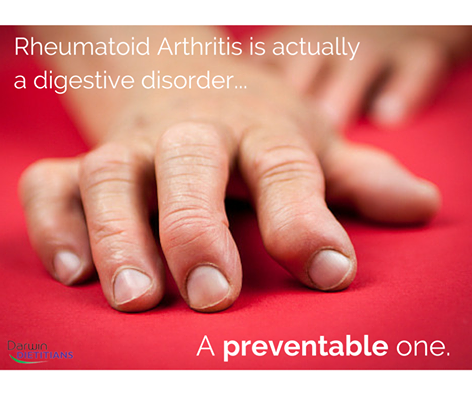 Did you know Rheumatoid Arthritis is almost always caused by a digestive disorder? A preventable one at that. Unlike osteoarthritis, rheumatoid arthritis is not caused by standard wear-and-tear… It’s almost always caused by a combination of genetics and diet. It’s actually an autoimmune disease closely linked to gastrointestinal problems. Think ulcers caused by illness or food poisoning or a stomach bug. Inflammation is what causes the symptoms. 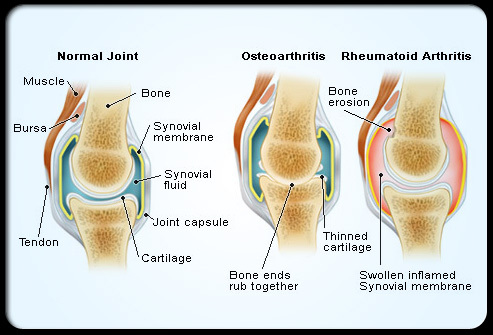 Comparison of normal joint, a joint with osteoarthritis, and a joint with rheumatoid arthritis. How Is It Linked To Food? Part of your gastrointestinal tract allows nutrients to pass through into the bloodstream, such as sugar and amino acids. However if the tract is damaged, it can ‘leak’ large food particles into the blood too. This triggers an immune response. Your immune system attacks and destroys any oversized food particles, much like it would for bad bacteria. Except in this case the foreign ‘invader’ is a poorly digested piece of last night’s BBQ. Fortunately (or unfortunately) the immune system ‘remembers’ foreign substances in order to react more efficiently next time. Ironically, it’s this mechanism that drives rheumatoid arthritis. Many dietary proteins that leak into the blood are similar to natural proteins found in your joints. With frequent exposure to these dietary proteins, your immune system begins to think joint proteins are those same foreign invaders; and they attack. It’s our own immune systems that are responsible for the pain and inflammation of rheumatoid arthritis. Immune-suppressing medications are just a lifelong band-aid. To actually remedy rheumatoid arthritis naturally, sufferers need to avoid eating the food proteins that leak through. They can also repair their intestinal lining with known beneficial nutrients such as zinc, probiotics and omega-3 supplements to name a few. At Darwin Dietitians, we specialise in the dietary treatment of autoimmune conditions. We can test your gut health and provide detailed meal plans, tailored to your specific situation. To make an enquiry or book an appointment, click here.